From 1 April 2019, pregabalin and gabapentin will be reclassified as Schedule 3 controlled drugs under the Misuse of Drugs Regulations 2001, and Class C of the Misuse of Drugs Act 1971. What this means is that patients will only be able to receive a 1 month supply at a time. Once a prescription is written by a doctor the prescription is only valid for 1 month and the medication must be collected from the pharmacy within this time. The change in regulations also means it will no longer be possible to send prescriptions electronically to a pharmacy. Patients can continue to order their prescriptions in the same way as usual but the prescription for this item will be printed at the surgery and will need to be collected and taken to the pharmacy. By speaking to their pharmacy it may be possible for them to collect the prescription from the surgery on behalf of patients. In anticipation of the change in regulations these changes have already been made to the prescribing system by the company that manages the electronic patient records and will affect all future supplies of this medicine with immediate effect. For patients who use gabapentin or pregabalin we would be very grateful if they could request any prescriptions in plenty of time, to help us manage the transition process. Please contact us or speak to your pharmacy if any further information is required about this matter. As from 1st October 2018, we became part of a network of practices (known as ‘hubs’) in Shropshire, working together to offer patients ‘Extended Access’ to pre-bookable appointments - in the evenings, at the weekend and during bank holidays. 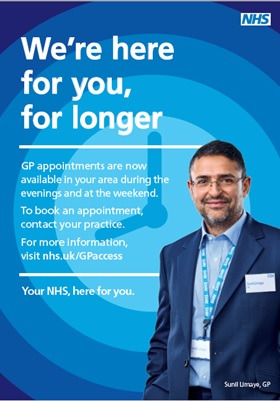 Part of the national agenda by NHS England, Extended Access means patients are able to make pre-bookable appointments to see a GP, practice nurse, or other qualified healthcare professional, at a time which may be more convenient for them. In Shropshire, local practices are working together in a network of ‘hubs’ to provide this service. The ‘hubs’ will take turns to provide the Extended Access appointments to patients. This means patients could be offered an appointment at their own surgery or at a nearby practice in the local area (part of the hub). Patients will be advised about appointment location at time of booking, enabling them to make an informed choice about their where and when they access care. but will be with a GP or other qualified healthcare professional. Cervical smear and NHS health check appointments are available through the extended access service - patients should just ring their own GP surgery and ask the receptionist for one of these appointments in an extended hours session. Self-care section of the NHS Shropshire Clinical Commissioning Group website (https://shropshireccg.nhs.uk/health-advice/selfcare/). Extended Access came into effect from 1st October 2018. Now is the time to organise to get protection by having your flu vaccine if you are in a risk group. Flu can make even healthy people seriously ill, with knock-on-effects for your family life & job. Anyone with a health condition* or aged 65 or over is more vulnerable to flu & needs extra protection. It’s the safest, most effective way of protecting yourself. The flu vaccine cannot give you flu. Please support us by having your flu vaccine here as we order these vaccines in advance for our practice population—having your jab with us will help avoid wastage of valuable NHS resources. Book your flu vaccine appointment now. Being transparent and providing accessible information to patients about how we will use your personal information is a key element of the Data Protection Act 1998 and the EU General Data Protection Regulations (GDPR). This Privacy Notice reminds you of of your rights in respect of this legislation and how South Hermitage Surgery will use your information for lawful purposes in order to deliver your care and the effective management of the local NHS system. It also contains information on consent, and how to opt-out. Please contact the Practice Manager if you have any concerns regarding the notice, or how we use your data. On 23/7/18 we implemented a brand new phone system in the surgery! Please bear with us during the first few days as we get used to this. Another addition to our surgery alongside the new phone system is Wi-Fi—of course accessible by our patients from the same date as above. Simply follow the onscreen instructions to get yourself logged in. We are also currently working on improving our social media presence. Updates soon to follow. If you are a user of Patient Access, you may already have noticed a change in the appearance of both the website and the mobile app. The new update promises a change for the better, making Patient Access more user friendly and more efficient. The update requires no action from the patient. Simply use your existing User ID and Password and you're good to go. If you have forgotten your user ID or any other details, you can simply use the 'forgotten' buttons to retrieve these details. There is also a brand new 'Support Centre' feature, where all the most common problems can be looked up easily. We want to enWe sure that patients who feel they should have their ears irrigated are fully informed of all the risks involved and know how to prepare adequately for their appointment. We have therefore compiled an information leaflet about ear wax and combined this with a consent form (see attached). *Patients who have never had their ears irrigated before should book an appointment with Sarah Bailey. This year patients become eligible for the shingles vaccine as soon as they reach the age of 70 or 78 but we are not allowed to administer the vaccine before then. Book a nurse appointment with our receptionists if you are eligible for the vaccination. Any eligible patients can receive their shingles vaccine at the same appointment as their flu vaccine, HOWEVER, they require a special appointment slot with the doctor during our Saturday clinics so would need to ring the surgery to ask our reception staff to arrange this. PLEASE DO NOT BOOK A DUAL APPOINTMENT ONLINE AS THE NURSES WILL NOT BE ABLE TO DO THIS DURING THE SATURDAY CLINICS - ONLY THE DOCTORS HAVE BEEN SCHEDULED TO DO THIS. From January 2018 the facility to request prescriptions by phone to our surgery staff was replaced by the on-line service. From August 2018 the POD service became accessible for patients wishing to order repeat prescriptions by phone. Patients can ring 0333 3583 509 and the team of staff will process their prescription requests for collection from their pharmacies. Patients should allow 4 working days from request before collecting items from pharmacies. 70% of patients on regular repeat medication are now using this helpful new service! Patients nominate a regular Pharmacy of their choice and all prescriptions are then forwarded directly to this Pharmacy electronically. This saves the patients needing to attend surgery to collect their prescriptions. If you have not already signed up, please see leaflets/poster or ask in reception for more information about the new Electronic Prescription Service. We have published a patient survey to find out a variety of useful information regarding our online services. If you could spare 5 minutes to complete this survey then we would be very grateful. All patients now have a named GP. The main purpose of this role is to reassure you that there is one GP in our surgery who is responsible for overseeing your care, that they will work with other health & social care professionals to meet your needs and that you have access to a health check if you want one. You can choose which GP you want, or we can allocate one to you. You still have the right to see any of our GPs, not just your named one. If you wish to know the name of your named GP then ask any member of our team.